TV host Jimmy Fallon is a man of many talents! Watch him sing a big Dolly Parton hit with Carrie Underwood. 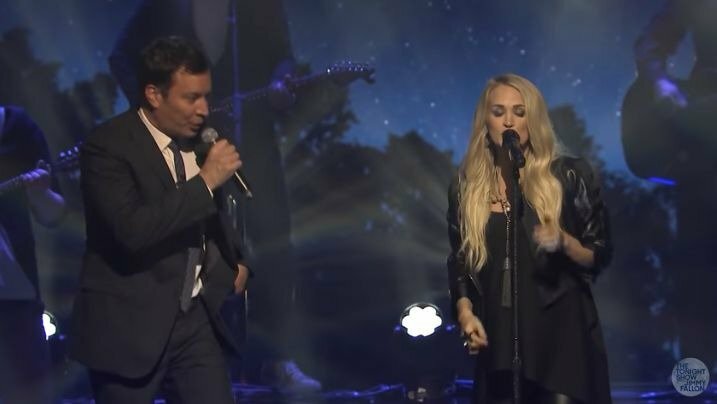 Jimmy Fallon showed off his vocal skills while singing an impromptu duet with Carrie Underwood. 'The Tonight Show' host and the former American Idol contestant sang Kenny Rogers and Dolly Parton's 'Islands in the Stream' for a special "Carrie-oke" segment he recorded after filming his show in Central Park. We have to give it to Jimmy, he is actually a decent singer. Carried stopped by 'The Tonight Show' earlier this month to promote her new album, 'Cry Pretty', but we are only now getting to see her duet with Jimmy. The album debuted at number one on the Billboard 200, making it her fourth #1 debut on the chart. She is the first female country singer to achieve the feat. The 32-year-old also scored 2018's biggest first-week sales by a female artist. 'Cry Pretty' sold over 266,000 copies, beating the 235,000 copies Cardi B's debut album, 'Invasion of Privacy', sold in April.